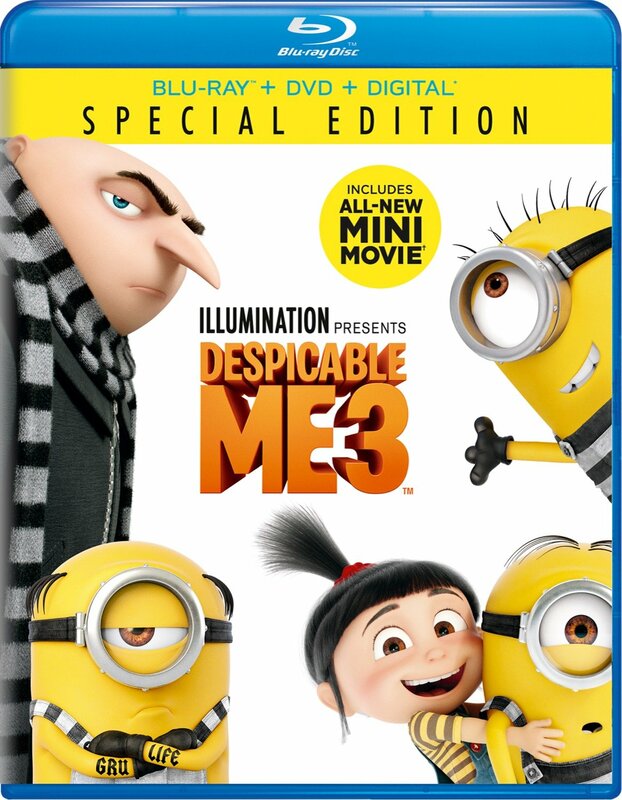 Illumination and Universal Pictures Home Entertainment present Despicable Me 3, available now. The characters beloved by everyone – Gru, his wife Lucy, their three adorable daughters—Margo, Edith and Agnes—and the Minions provide hours of family fun in this heartwarmingly subversive comedy from Academy Award®-nominated producer Chris Meledandri (Despicable Me Franchise) and directors Pierre Coffin (Despicable Me Franchise) and Kyle Balda (Minions 1 & 2, The Lorax). Hailed as “the best Despicable Me movie yet,” by Ali Plumb of BBC Radio 1, with over $949 million in global ticket sales, Despicable Me 3 is the ultimate holiday gift, with almost an entire hour of exclusive bonus features including an all-new mini-movie, a never-before-released deleted scene, and much more! Despicable Me 3 is available on 4K Ultra HD in a combo pack which includes 4K Ultra HD Blu-ray™, Blu-ray™ and Digital. The 4K Ultra HD includes all bonus features on the Blu-ray™ disc. I was hooked on Despicable Me when the first film came out. The two films after the original are just as good. The crazy, yellow Minions are what really draw me in but the plots are interesting too. The latest in the franchise, Despicable Me 3 starts out with Gru being fired from his job after some embarrassing mishaps from a villain, Balthazar. His mood shifts even more downward than normal. He finds out that he has a twin brother and is encouraged to meet up with him. The family takes the trip and Gru learns he is the polar opposite of Dru, his twin. Dru convinces his brother to pull off an incredible heist. Spending time together, both learn that having each other as a brother isn't so bad after all. There's humor, campy schticks, cuteness overload (especially from youngest daughter, Agnes) and an ending theme about family. The 80s references and music were an amusing addition, giving adults the chance to laugh at things remembered from their past. My family and I loved despicable me 3.